In this article we'll see how Moss can create, deploy and monitor a Rails application. 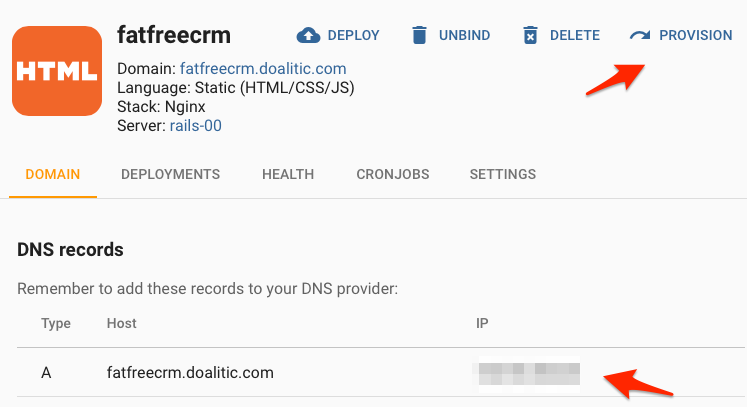 We'll use Fat Free CRM as an example, but other Rails applications can be set up similarly. We also assume that you use git in your development workflow. If you haven't done it yet, you must have at least one server in Moss. You must be the admin of your Moss's organization in order to perform this step. While it doesn't make much difference, we note that the server we've used for this article runs Ubuntu 18.04. Don't forget to upload your public SSH key onto your server, since you'll need to log into it via SSH in the following. Now you must log into your server as user moss and install Ruby by any means you feel comfortable with. In this example, we'll just use the software package that comes with Ubuntu 18.04 (note that Fat Free CRM supports Ruby 2.5). You must be the admin of your Moss's organization in order to perform this step. If your application relies on a database (as it likely does), you'll have to create your database and user by any means. Create a database user for your application: fat in this example. Create a database for your application: fat_free_crm_production in this example. Grant fat permissions on fat_free_crm_production. Now we're ready to create our website with Moss. Since Rails is not natively supported in Moss as of this writing, we'll choose "Static" as the language of our website - in this way, Moss won't install any software that we won't use in our server. The git repo in this example is a fork of Fat Free CRM. The only difference with the upstream is that we've updated the file Gemfile.lock with the appropriate dependencies. Everything not in your git repo must be specified as shared directories or files (files with secrets, user-generated content, application logs, etc). 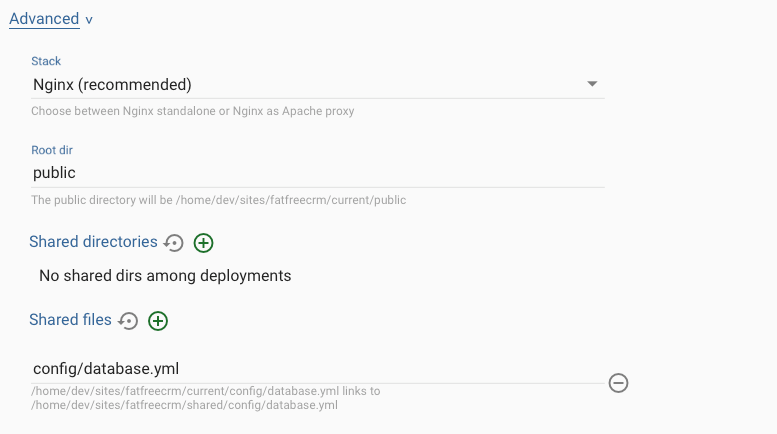 In the case of Fat Free CRM, we specify config/database.yml as a "Shared file". Finally, we click the 'Add' button and wait for Moss to finish the process. Since shared directories and files are not part of our git repo, we must provide them within the folder /home/<site-user>/sites/<your-site-name>/shared/. Now we'll tell Moss what commands it must run on our server in order to successfully build our application. In this example we just need to provide a pre-activation script that installs all dependencies, runs database migrations, sets up an admin account, and compiles static assets. Then click 'Update' and, after it successfully ends, click 'Deploy' and wait for Moss to finish the process. If there's any problem during the execution of your deployment scripts, you can take a look to their log as user <site-user> in folder /home/<site-user>/sites/<site-name>/logs/deploy/. 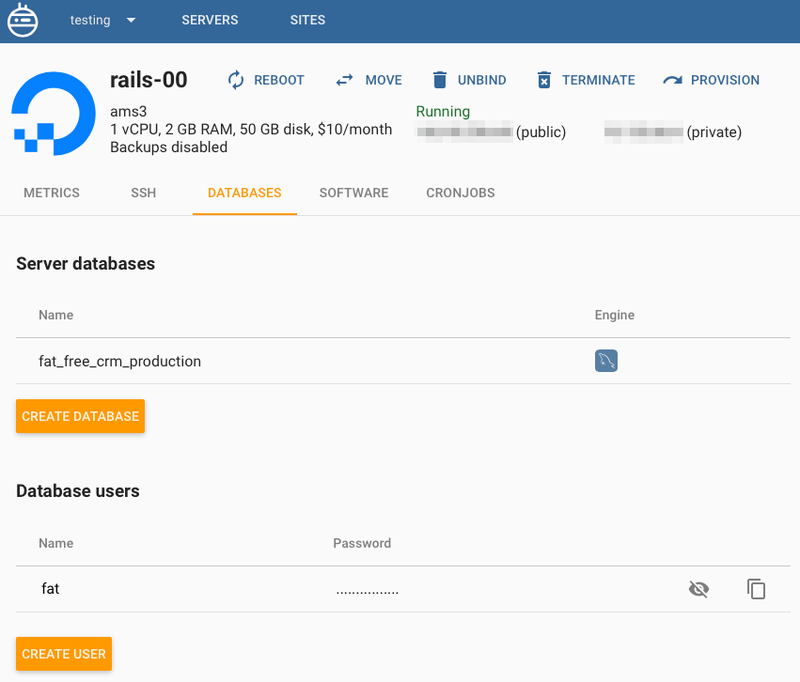 The command bin/rails server starts a Puma application server to run your Ruby application. By default it listens on http://127.0.0.1:3000. Instead of blindly running such command in a deployment script, we're going to create a supervisor process that will restart Puma in case it hangs. At this point your application is deployed on your server and it's reachable locally on port 3000. To make our app globally available, we just need to set up Nginx as a reverse proxy in front of Puma. Now you can update the appropriate DNS records, wait for them to propagate, and check your application is working as expected. In case you cannot update your DNS records now, you may wan to add a domain alias based on your server's IP address. Just keep developing your application and deploy it manually or automatically (after git push ) via Moss.